Home › Rick's Rusty Relics › Rusty Relics: Back in action! Years ago, a friend gave me a flat bed body that came off a pick-up truck. I didn’t have an immediate use for it, so when my friend Ken Scurry asked if he could have it to put on his truck, I said OK, with one provision. If he ever decided to get rid of the bed, I wanted it back. 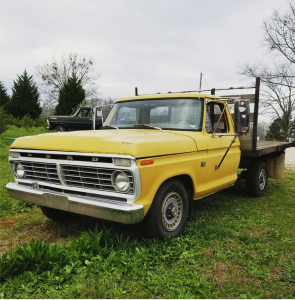 Fast forward a lot of years, the yellow 1974 Ford truck with my bed on it had served the Scurry family well. His kids learned to drive in it, and it was a fixture in the community before the six-cylinder engine broke a rod. Ken told me I could have the truck, but with a provision. He didn’t want it sold because of what the truck had meant to his family. Since I hardly ever sell anything anyway, I agreed. I let way too much time pass before I started working on it. It was almost completely overgrown by trees and bushes when Chase Wilson and I cut it free. The engine was beyond fixing, so I went looking for a good used one. 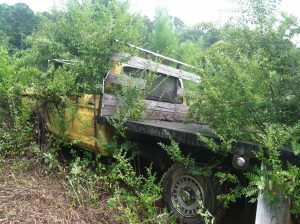 They’re tough to find for a truck that old, but my buddy Oliver Gentry, who has a great salvage yard in Newnan, came up with a 1984 model engine that his manuals said would work in my truck. Bobby Nichols helped me take the old engine out. That was relatively easy. Putting the new one in was more of a challenge. Chevrolet engine swaps are fairly easy. Most small-block Chevy engines will bolt right into a vehicle far older and far newer, with little changes required. Fords generally aren’t that way. Before I got that engine in, I’d changed nearly every part other than internal ones. I swapped the carburetor, engine mounts, fuel pump, water pump, distributor and about anything else that comes off with a wrench. Eventually, everything line up, and the engine ran great from the start. Having sat so long, the brakes were ruined, so I replaced the master cylinder, calipers and rubber lines. The transmission leaked before I got it, and I got the leaking slowed down, but it still leaks a little. The tires were shot, so I got new ones. The headlights would work some of the time, so I decided to change the light switch. I’m kind of weak on electrical stuff, so I was dreading changing that switch. But I looked up a You Tube video and after watching that it turned out to be about a 15-minute job. I’ve learned that there is a You Tube video for about any automotive chore. I drive the truck fairly regularly, but there are still a few things it needs. I put the rubber bushings in the door strikers the other day, and it cut way down on the rattling. There are still remnants of trees that had grown up between the front bumper and the rest of the truck. I think I’ll just wait for them to rot so I won’t bend the sheet metal behind the bumper. The paint’s faded, but I like the way it looks. Barbara Mandrell used to sing about how she was country when country wasn’t cool. I like to say I was into patina long before patina became cool.